It begins with my long-term love-affair with cheese. It’s OK, my husband knows. He also understands that he can’t change the fact or compete with my dessert-island scenario companion of choice. Like any any addict, I try to limit my access, and so I usually only have two choices in the fridge – cheddar and something a little more exotic like Cambazola (which is like a heavenly blend of Gorgonzola and a soft-ripened, triple-cream French style cheese) or Roquefort. I would love to make 4 Cheese pizza each Friday night but as I only ever have 1 or 2 types available, it ends up more like 2 Cheese pizza. Which is still pretty great with a few sprigs of rosemary added to cut the richness. 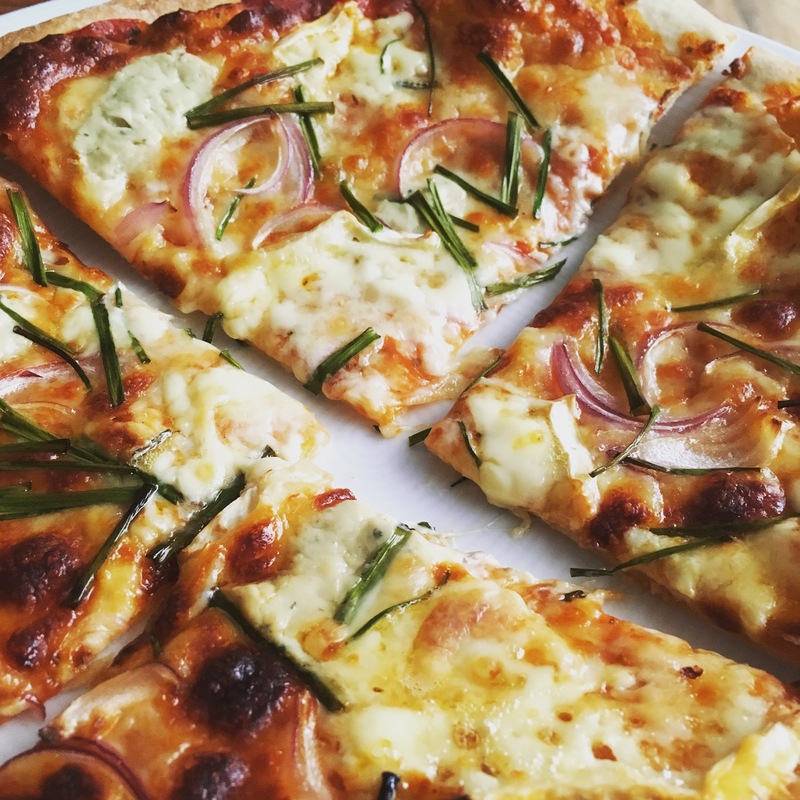 So one night, I tried my favourite combination of mozzarella and Cambazola sprinkled over your basic tomato sauce-base, but this time I added some thin slices of red onion and some long chive cuttings. The result was mind-blowing and so now I share it with you. If you don’t have the time or interest to make your own dough, I’m sure you can re-create the magic using a store-bought base. But if you do have time and an electric mixer, then here is the recipe I use for pizza dough. Throw it all in the mixer with the dough hook attached and mix until the dough comes together and starts slapping about in the bowl. Proove for at least 1 hour.